Landana Fresh spreadable goat cheese MILD is a delicious pure cheese. It is smoother than the usual fresh goat cheese and is easier to spread. Perfect for sandwiches, bagels or toast, but also suitable in hot dishes. Moreover, this fresh cheese contains only 16% fat while not losing its delightful taste. 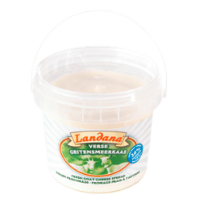 Landana Fresh spreadable goat cheese MILD is gluten free by nature.